Buy now and save 25% off of regular prices. Furthermore with this bundle purchase we offer you a second license free to install these programs on your laptop, it is a great deal! Playlist Manager is a powerful playlist creator, manager with multimedia players. You can fast and easy create playlist in formats: M3U ASX WAX WVX WMX WPL B4S PPL SMP PLS XSPF ZPL PLA. You can create playback lists for bookmarks and scheduling systems. It includes Playback Statistic, Playlists Converter, Direct Playlist Creator, Playlists Database, Internet Radio and File Searcher. All major audio and video files are supported. Sprintbit Media Player is a multimedia player with useful playback scheduling features. You can create playback lists and schedule files to play in many ways. 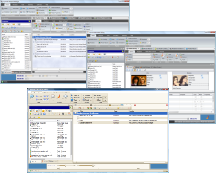 It includes Playback Statistic, Internet Radio and File Searcher. All major audio, video and playlist files are supported.